Dozens of Fordham alumni are already chatting, sipping, and laughing on the top deck, but the yacht is still in port, and Justin LaCoursiere, FCRH ’12, GSAS ’13, is still standing on Pier 81. 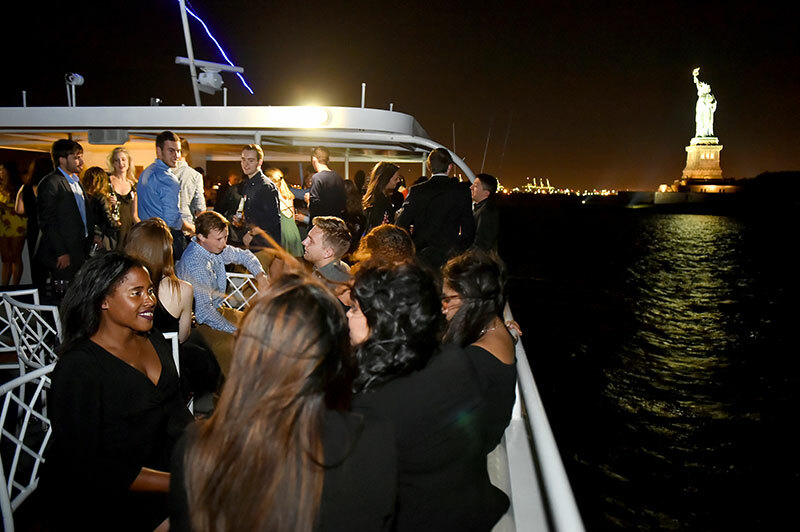 The Cornucopia Destiny is chartered to float around Manhattan for the Young Alumni Yacht Cruise, a three-hour dinner party for nearly 300 recent graduates. But that can’t happen until everyone is on board, and one grad, who shall remain nameless, is not yet here. The Starrett-Lehigh Building looms on the Chelsea waterfront, bigger than any cruise ship, a marvel of Manhattan. In his day job, LaCoursiere is the social and digital director for RXR Realty, one of the biggest commercial landlords in New York City. At 26, he’s already conquering his corner of Manhattan, sharing stories about parties with Derek Jeter and a rooftop spin class with Ralph Lauren designers—but his day job isn’t what brought him to this yacht on a Friday night in September. This is the Fordham cruise, and he’s the chair of the Young Alumni Committee this year. The group serves as a bridge to Fordham for graduates from the past 10 years, helping to organize social justice activities, coordinate alumni giving, and plan social events. The cruise is the committee’s first big event of the year, and the chair decides he’s not boarding the yacht until the last guest makes it up the gangway—top-deck partying be damned. But then she appears, the one missing alumna, wearing a brown leather jacket and a sky blue silk scarf tied around her neck, chic enough that the slight delay is forgiven and forgotten. Later, on the top deck, LaCoursiere shows off his own style, fitting of a Fordham fanatic: maroon slacks. That attire paid off when LaCoursiere was touring London as a member of the University Choir in 2013. His maroon pants caught the eye of Jeffrey Cipriano, FCLC ’14, who was studying at the Fordham London Centre at the time. “He was begging his friend to introduce us,” LaCoursiere recalls, beaming. They hit it off, and, after a date where Cipriano cooked—“he’s a phenomenal baker,” LaCoursiere says—they’re still dating, four years later. Last fall, they and several other alumni helped found the Rainbow Rams, Fordham’s first affinity group for LGBTQ alumni. In June, approximately 30 of them marched under the Fordham banner in the New York City Pride Parade—a first for the University. Behind him, dozens of alumni sing along. Some swing dance. Others jump. But most stand still, drink in one hand, other hand stretched out toward the sky. In the distance, the Statue of Liberty strikes the same pose.